They scammed me to sign up with them. I signed up and was getting phone calls about gutter cleaning. We build high end outdoor amenities. They are nothing more than a high priced fake referral company. Why do you have to login for the “full experience “? Then, you try and because One of the common login services happens to use 2FA auth, you have to switch apps to get the number but no, the app just sits there when you go back to enter the number. Bad design. Bad requirement. Let me know when you fix it an maybe I’ll give you another chance. I don’t like the new version. Can’t browse like I used to. Can’t search by style. Cant access the app when registering using gmail with 2-factor auth enabled. When switching to Gmail/Google Authenticator (or maybe any app) to validate the authentication request and toggling back to Houzz it just shows the 3 dot loading screen indefinitely. I’ve tried closing the app and trying again, but it doesn’t work. App no longer available for lower than iOS 10! I can't reinstall the app, after I reset my iPad. It says my iOS version is lower than 10 and the app is not backward compatible. Why am I forced to buy a new iPad now, even though my old one works great? Scammy app. Scammy company. Skip. Once loved this app and used it all the time. It is now worthless and advertises things not even applicable to ANYTHING in the photos. Such a shame because it once had so much potential. For me, this app is perfect. To see a look I love, and be able to click and purchase a product is amazing! I’m in love. No longer a good app! After giving rave reviews 3 years ago, I am no longer a fan. The app constantly crashes and I'm using the same device as before. I also detest the way Houzz has replaced some former features. I liked being able to click on an item in a photograph to reveal the buying source. Now, a bunch of useless "similar" items pop up which is infuriating. I LOVE the app. We plan on building our house in about a yr or so. But some pictures are TOO extravagant. Don’t get me wrong, the products that Houzz offers are beautiful, but my experience with Houzz so far has been the worst. I bought the perfect desk for my room, and when it finally arrived, the corners of the wood were chipped off, there were blue marker drawings, and it was dirty. I believe it was a desk that had been used, then returned. I immediately called Houzz & they kindly sent me another one. However, the shipping of the new desk is taking foreverrrr. I am currently sitting on my kitchen table waiting for that desk to arrive. It’s really annoying. I was supposed to have my desk set up two weeks ago. R & E Remodeling did a great job of replacing some outdated iron posts with wooden posts in my carport. They arrived on time to start and worked full days until the job was finished. I was very pleased with their work. The price was spot on with other quotes that I received but I chose them for the good reviews I read. I highly recommend them. I’m already planning my second home repair project with them. I bought a trípode floor lamp. The box come completely destroyed. I called, sent pictures and they not only sent to me a new one but the time was unbelievable fast. What a team. Always going to buy from them. This app was great until I no longer am able to use my ideabook offline. This app is great, i am in to real estate and staging a property is key to selling a property. This app has given me great ideas for staging my properties and putting the house into perspective before finalizing the finish product. Trying to leave this comment reminded me of when I played video games as a kid and just as I was about to beat my younger brother he would jump up and turn the console off so there was no record of the game even occurring. In this case, every time I try to leave a negative comment the app ‘unexpectedly turns off’ I wonder if my brother is working for Houzz, hmmm. Seriously put, this app is great... when it works. Ultimately, too temperamental for me though. Only designed to manipulate you into buying products. Love so many features but contractors and designers should be required to answer questions. So frustrating. And paint colors (not not Benjamin Moore guesses/ equivalents should be posted with the picture. The latest update causes the app to render a grey screen when I invoke the app on my iPad. I can no longer view content. Makes the app useless. Development team: This is not the way to retain customers. You need to test your changes before integrating them into the app! Horrible... they find every excuse not to show up. It’s been over a year and they are still not done! Left us w/ a disaster and have not been back to finish. DO NOT USE!! This app has not been working lately. So frustrating since I am in the middle of a new build and the app is useless. I tried to post a review about a company and houzz won’t post it!- Sketchy! I love houzz platform and user experience for design and design ideas. The e-commerce side is badly run and has terrible control over the delivery of products and third party sellers!!! After needing to return a item that required delivery I have dealt with 5 separate customer care groups to organize a return and replacement. Lesson learned - purchasing elsewhere! I’m currently building a house and Houzz has been super helpful during this process. However, every 2 or 3 days, the screen goes white and stays that way, until I delete the app and then download it again. It’s super annoying when I’m at a meeting with builders and can’t pull up the information I need. After several attempts at ordering 4 light fixtures through the app, I gave up and bought them from somewhere else. Houzz is such a great resource. I hope this problem gets resolved, because at least in my case, they lost potential business in the retail aspect of their app. Until then I will just keep deleting and re-downloading the app to get to my Ideabooks and their awesome photos, but making my purchases through sites that won’t crash on me. I used to be obsessed with this app, but now it seems they’ve started adding novice photos with mediocre design? Maybe some people like it but I used to love the high end photos and design because they were more inspiring, I don’t want to see a photo of a toilet seat that I could have taken myself (truly, this is a photo). Who is regulating this? Very disappointing. Can someone please tell me where to find this feature!!! They have cool stuff to look at but none of their design tools are at all useful. And their video of previewing furniture in your room with your phone camera (like augmented reality) is a straight up lie. I use this app very often and I have loved it up until tonight when it just stopped working. When I open the app it acts like it has loaded but the screen is blank. I also can’t access houzz.com. I hope they fix the issue soon. Received my order damaged and trying to get a refund is challenging. Houzz doesn’t even use their own app to message back to buyer(me). They use only my email address and with the amount of ad emails they send it gets caught in spam filters quite often. I will probably never see my $300 again. 🤬I’m sure they are good when everything is working but they reveal the real company when things go bad. I really enjoy shopping on Houzz and it gives me a lot of inspiration. I remove a star because every time I click on see all reviews button, I can’t go back to where I was before. I am stuck there no matter what I do. I have to delete the app and reload it to make it work again. Major pain. I use Houzz for nice, beautiful ideas that look like show rooms. Letting random people post pictures has tarnished the quality of photos on Houzz. Please bring back the sort by popular pictures button and please only allow for professional, high quality photos and rooms to be shown. With these fixes the app will be back to a 5 star. Thank you. I hardly ever use this app anymore because the pictures take too long to download and sometimes don’t at all. You took a great website app and turned it into a convoluted nightmare to use. I find myself clicking randomly in order to view design ideas. It’s just not good anymore. Feed won’t refresh. I have to uninstall and reinstall to get the home page to refresh. Incredibly frustrating. App works wonders aside from that. I used to love browsing Houzz for ideas and inspiration. All of a sudden, it’s like somebody swapped in “Terrible Real Estate Photos”. Seriously, I just saw a picture of cleaning products shoved haphazardly under the sink. And another of slot machines in a casino. That’s not inspirational. And what happened to the sort options??? We were huge fans of Houzz and used them when designing our house but we have since lost all trust and appreciation for Houzz after trying for months to get a negative review posted (about our builder, who currently has a Houzz award showing on their business page) and running into an endless cycle of our review being refused, inquiries to their support system (which is only via their site), trying to talk to someone to find out where we were violating the review policy and getting endless generic answers in response then rewriting it again only to start the cycle all over. We’ve decided at this point they are blocking us from posting a negative review and now we no longer trust any of the reviews on their site. Beware if you are reading stellar reviews about a company on their site you might only be seeing a filtered list of the actual feedback with negative reviews never being successfully posted. I hope this isn’t true and they redeem themselves but after so much time, so many support tickets and even just now getting hung up on twice when calling their only published number, it sure seems international. Loved this app, but now it no longer updates photos on the home screen. I love this app. That being said.....lately the home page is stuck with the same photos day after day...never changing. So....I delete the app and reinstall it and ......it is updated. This has happened several times. I hope this bug will be fixed because our bathroom remodel is in the near distant future and I need help. Thank you! !!! In our opinion, no, just no! We used them and never had a follow up after seeding. They seeded an entire area we asked them not to seed (because we told Bob we wanted to garden where they actually seeded). We had to rent a tiller to get rid of the grass (that not only we were charged for, but had to pay to rent a tiller to take up). No one ever came to follow up after seeding and we have a ton of rocks in our grass that we paid to have taken up. DO NOT RECOMMEND!!! Houzz only posts positive reviews submitted by users. This may make them attractive to contractors but is very unfair and dishonest towards customers who use their app. I want true results when selecting a contractor not just results that benefit the company and Houzz. I wrote an honest and thought out review that was not positive and it never showed up. I write both positive and negative reviews as experienced. Who else use this for BTS ffs?No not the dirtiest ones....This is a good app thanks for having this app!Now I can make a lot more FFS!! Angie is an awesome designer. She is honest, hard working and has made my house into a beautiful home! I recommend her to everyone I know in the greater Sarasota area. Tried downloading and deleting and this app doesn’t work at all. Is anyone having this problem? I received the wrong product and had to type in the order number, i couldn’t copy and paste it, which was super annoying, and then, as part of the return process I was supposed to upload photos of my items, but the ap would have an error when i tried to do that. It was super annoying that when I actually needed the ap to function because i wasted money on a bad order, it wasn’t doing its job. I already purchased a few items from Houzz in different occasions, and this is my conclusion: don’t risk to pay for a stressful experience by purchasing items that are over a small drawer’s size. I got recently a bookshelf delivered to my home. And only then could realize the assembling parts were simply too big. It barely crossed my front door, and the parts were too bulky and heavy. Problem is I’m currently seven months pregnant, and this type of labor could be dangerous for me and my baby. Their product description is not precise enough. First, providing just the dimensions of the furniture assembled doesn’t tell you how the parts are. Secondly, you might read generic promises like “30 day return” or “full refund” but that only applies to specific cases, that you’ll confirm only when it’s too late for you to cancel the order. So you think there is no risk of not seeing the furniture in person first, but you’re wrong. After the delivery is made, even if you didn’t pay for shipping, they’ll make you pay it back. And not even think you might get an answer if you ask this type of questions upfront. They don’t reply to inquiries. They actually don’t read them, even by email when you have an open case they keep replying with automated templates. In the return process, the customer service totally ignored when I informed the package doesn’t fit any car, and it’s a health risk for a pregnant woman. They sent me a label, which costs half of the price of the furniture, for me to basically figure it out. I can not even buy a better bookshelf because I have this giant elephant hanging on my room. They don’t take responsibility for their mistakes, and not even tried to consider the possibility of a full refund. I ask them to contact the builder and let them know about the problem, but Houzz sent me a link to review them instead. It’s all about links, nothing about a good user experience. Is a perfect example of good technology and terrible awareness about what is a quality customer service. In my condition, this type of app could solve a lot of struggles I have to deal with when going to stores and buying furniture in person. But Houzz don’t really care about their customers, as we’re just a credit card number for them to charge as they find convenient to their own interest. Vero Nice app. Please consider adding a slide show option for the pictures. It’s ok but I wish it was just an actual game not a real thing that has to do with YOUR house. I ordered a product from this company & somehow the info they had on the same page was not exactly what I was ordering so when I called them to send it back & hey a refund they had to send my info to a third party. Never called me back and never took care of the issue. If a company can’t take care of your needs themselves and handle issues like mine the way Target or Walmart can I don’t think it’s worth the risk. I’m just thankful I didn’t purchase my final product with them which was more costly. I really love the Houzz app. I've not only saved ideabooks, but used the app for resources for my home. So its extremely disappointing that with the latest update my Ideabooks were deleted and/or seems to be reset. Hope this and the app crashing gets corrected. Never have had to re-log in to app on iPad but today it's telling me that I have to sign in, but when I do, it tells me that my account is already in use, which it is not. Please fix this bug! I would hope Houzz would research contractor and make sure they provide proof of their work, license and references before letting up add an account. I found a contractor here called Pro Home Renovators out of Levittown, Pa and he was a total scam. Scam me of a lot of money. I reported to Houzz and no one has called me back or respond to my review. Latest update makes the app unusable. Crashes as soon as I select a photo to view. Tried reinstalling but it still doesn't work. Wish there was a way to go back to previous version. I used to love this app...but no more. The photos take forever to load, if they load at all. Searches with multiple criteria no longer work. What happened to the downloading of an idea book feature? This was excellent if you needed to show someone pics you’d saved and knew wireless wouldn’t be available. 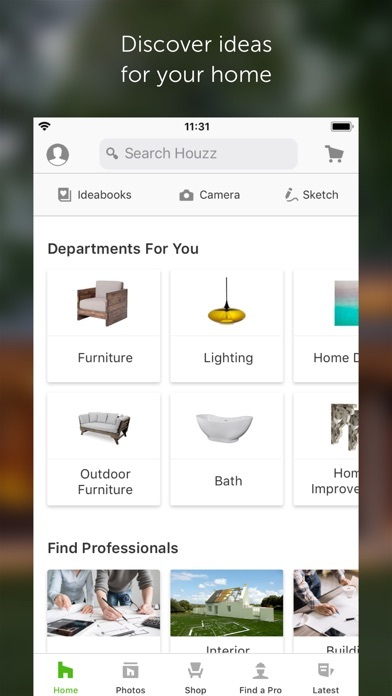 Rather than making a great app better, Houzz has somehow found a way to screw this app up over time. I’ll try it a few more times and if it doesn’t get better the app will be removed from my iPad. I love houzz! But when I click on the icon, I just get a blank screen! Where are the pictures? Where are my saves? Please help! I need those pictures to show my landscape architect. The app is incredibly user friendly and fun to use until my screen goes white, and I’m unable to do anything. Rebooting my phone doesn’t seem to work either. It’s unbelievably annoying. After you select and image on your phone you aren’t able to hit the back button. To your larger query. The back button often does not work on iPhone X. You have to close out of the app and start over after you’ve enlarged something for viewing which is not very functional of course. It’s like Tinder, but for your house! I have loved EVERYTHING about this app since finding out about it on QVC in 2012, but I absolutely hate the new app icon design. I wish you had left it the same. When I began my new home build process I used Houzz to gather ideas and then shared them with my architect and builder. My dream house is exactly what I wanted and was completed ahead of schedule. Great app, but why in the world did you change your logo? Not good, looks unfinished. Your other logo at least had style. Products are really nice but, will be a nightmare for you and your product. Customer service horrible. Lack of communication And after they mess it up. They just say sorry. And you project will be delayed which will cost you money plus no options or willingness to help you. 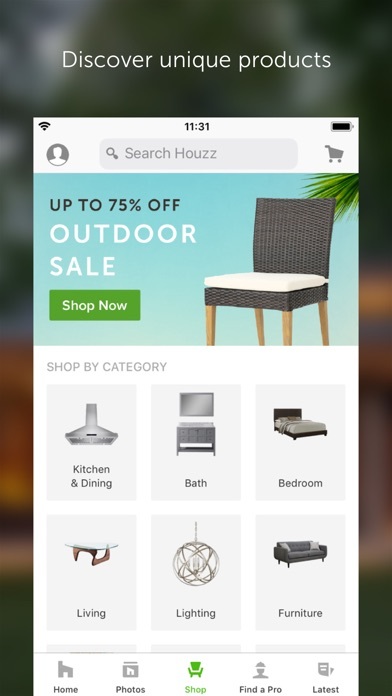 Update gave new Logo: Houzz symbol was unique, now it reminds me of Groupon, blech This app is great to get ideas for any kind of house or room. I like that the collection is so huge, and sortable. Privacy’s back👍🏼 More “average” homes please! I like seeing all the styles & choices, but I would really like to see more “average” people homes. There are many homes worth millions that pop up in a search such as “tiny kitchen.” Some tiny kitchens show up, but most probably cost what my whole house is worth. Please consider the non-rich people who have to do it all themselves (& enjoy it!) & don’t have designers & architects at their beck & call. I have nothing against architects or designers! Hooray for what they do;-) I will just never be able to hire either & would like choices geared to my kind. Your logo was so lovely before. I enjoyed keeping the app on my phone just because the icon was so nice and occasionally I’d use the app while it sat there, even if I wasn’t currently working on a project. But this new logo is a huge eye sore and I want to delete the app just because of it. Ugh. I was hoping to get a proper home design experience that was different and mixed well, but nope, another run down Pinterest. I have not received my order yet! Last Tuesday, I ordered an ornament. In the app, it says that the shipment takes 3 to 5 days. But after 7 days I have not received it yet. Today, I checked my account in the app to see the status of my order, but I was surprised that my recent order page is blank. I am completely dissatisfied with their services. I mean, what is that? First, I thought poorly drawn factory. That morphed into 8bit horse. Showed the wife, she thought it was a child’s drawing of a dinosaur. Not sure which is more astonishing, that someone came up with it, or that some jackass approved it. When it works it’s my favorite home design app. When it doesn’t (frequent bugs galore or just simply won’t open) it’s frustrating, especially when trying to access saved images for projects. New app icon and s SO UGLY that I moved the App off my desktop so that I don’t have to look at it!!!! I used to like houzz. The forums with comments from designers and architects made for a pleasant experience. Now, the app has price tags all over professional photos. The price tags have links to cheap products that houzz sells. I don’t like it. Photos saved to galleries was a useful tool. The point to having pinned photos into galleries is to show professionals a look. It’s a way to tell a design story for those who aren’t designers. And it would help clarify the taste for people who don’t have a design vocabulary. Now it’s all junked up with dangling price tags and links. So sad. It all feels very venture capital. Good luck with that! The app isn’t the problem, the junk they’re selling. The horrible customer service. None of the contact or return links work. They figure they can wear you down and just keep your money. All while you’re left with worse than dollar store junk. Perfect job! Fixed all water leaks and on budget. Will never use anybody else. I love the Houzz app but I cannot open since the latest update. I absolutely love this app. I have been using it for years, but recently I’ve updated it to the most recent version and now its slower than ever. It becomes very frustrating when I’m trying to enjoy scrolling through pictures of some lovely houses and all I see are empty spaces if not a blurry photograph. Truly helped me make decisions for my new living room. I use this app all the time and have gathered many fabulous ideas for our new home. I regret getting the app and getting an account. I can’t stop the emails no matter how many times I unsubscribe. The more times I unsubscribe the more emails I get. I have them all going to my junk folder now. Hopefully after not opening the app or going to the website for a while (forever) maybe eventually the emails will stop. T-mobile partnered with houzz so i got 15 $10 off codes one from each line and place orders. Orders went through fine and was told it would ship first week of march 2018. Even after successfully place of orders and getting confirmation of orders, the next day they cancelled all orders. Such a unprofessional service they should not have allowed to place the order at first place. I had started to like the app/site but the next day hated it and not good customer service. I love many features of this app, but recent updates seem to have removed some of its most useful features. I use Houzz Ideabooks as a tool to help with remodeling and design ideas. The original app for years allowed the user to move photos around within each Ideabook, allowing one to compare a subset of ideas (e.g., compare bathtubs in an Ideabook on bathrooms) but that ability suddenly has vanished without warning, as has the ability to move from one Ideabook to another. This greatly diminishes the app’s usefulness. Help! Freezing the contents and placement of photos in Ideabooks is not a good idea. Thank you! The search engine is whacked. Not organized. Very hard to find what you want. For example if you're searching for just kitchen the search results will give you irrelevant pictures. It’s a waste of time. You are better off searching on google. When looking at closets, for example, a price tag will show up for the closet materials, however when clicking on the “price tag” it brings up kitchen exhaust fans instead. Please fix this show the correct items for each category thanks! After I did the usual iOS tweak on my iPhone 8 Houzz and my ideabook have disappeared. When I tap on it, just a white screen. Nada. Before that and still on my new iPad (that also has the iOS tweak but still has Houzz) it crashes frequently. Please fix! This app is fantastic. I have so many ideas to choose from, just makes building your dream home even easier. Excellent photos generate a myriad of ideas! I use this app for so many situations. Color schemes, room layouts, accessories, trim, flooring, just about anything. Really love the feature to create folders and add comments. So convenient to show others what I found. I’ve loved my Houzz app for a few years now and have many different idea books. I just recently tried to open the app and nothing is working. No pictures will load and all my ideabooks are gone. I’ve tried update, deleting and reinstalling and nothing helped! Love the awesome pics and tips! UPDATE: Support immediately contacted me after I posted my negative review and asked for details about the problem. Within days they notified me they had found and fixed the bug. Just updated the app on my iPad and no more crashes!!! Changing my rating to 5 stars!! ....When reading long design dilemma threads, the app crashes, forcing me to locate the thread and start over. This happens on all really long threads with several hundred posts. Once the app starts crashing, the only way to read to the end is to switch to Safari. .
No C&B furniture in “in room view”? I click on see in room view but there is no Crate and Barrel furniture in the picture? Great idea if it worked. Every update makes it even better! Thank you and Continued Success! As a professional designer, I use this app on my computer of the time. However, using it on the iPad is somewhat challenging. When you try to make a comment, the typing is not always accurate and you can’t go back, and to make it worse, then you can’t even post it! Additionally, you can’t delete individual pictures from boards; you can only delete the entire board. Perhaps this function exists, but I haven’t been able to find it. I hope the developers read these reviews and learn from them. Great helpful app for having multiple tools and idea with ways to reach professionals to implement. My one drawback is no tab or easily searchable prompts for finding professionals that can remodel or build to ADA specs. Needing to adjust my parent’s home for disabilities and can’t find a professional proficient in the task. Latest update eliminated all my bookmarks. Supposedly now in ideabooks....not there. Gone completely. Trying to figure out how something will look? Houzz makes it easy. Scroll through hundreds of ideas quickly. Love the material sourcing feature. I like the app but Players do not follow guidelines or rewards those who do. Players who decorate with rustic, contemporary, modern etc items are not voted by other players as doing a good job while other players who do as they please are selected as an excellent design. Players rarely vote for rooms using colors tend to reward all black/white rooms. In order to garner enough votes to win a prize you have to buy expensive items to decorate your room. The game has charged me for expensive items and then not given them to me. Had to write the game to be reimbursed. Although I was reimbursed, it made me wonder how many problems I may have missed with a large inventory of decorative items. Many of their designs seem to only be geared to use up as much expensive inventory as possible such as holiday items, art, rugs etc. I love this app. Lots of great ideas and options to buy. This app is a spam don’t get it!!! It is terrible I wanted an app to design a room and I soon as you put on your email it spams you with stuff don’t get it!!!! I had runners laid on my steps and they are magnificent! The owners and installer bent over backwards to ensure I was happy and even beat a tight deadline I was facing prior to surgery. They helped me thing through my runner choice and felt like family! This app has grown its offerings nicely over time. I really like their TV episodes. Also liking their built-in shopping. I’d like to see search remember where I last left off in a list of thumbnail search results. Right now it seems to revert to the top of a list of thumbnails after drilling into a photo which is disorienting and fatiguing after a while. I’d also like to see more variety in ideas for the photos. When I search for modern style, for example, countless results look so similar. Houzz should be pushing to surface unique results that feel fresh and not stale. Love the app but exiting out of a photo takes you to the very top and you have to scroll down again, which is VERY annoying. Aside from that, really good. I use Houzz on my phone all the time, but the last time I logged in I realized something small but very important has changed. When you search for an idea and scroll through photos, then tap on a photo that looks interesting, then tap on the the arrow that takes you back to photos, it refreshes to the top of the page!! Seriously?!? Sometimes I look through photos for a long time, and now I have to scroll scroll scroll just to get back to where I was in the photos list, if I can even find it. Definitely hinders usability in a major way. Plz fix. When I first downloaded this app I had no idea what it was about. Now I've been playing with it I know you make a design for your dream house, then you buy the items for your house. They delivered my order to the wrong address and then refused to replace or refund me. Don’t order from them!!!! I received wrong goods. Seems like this service is a pass through from sellers offloading their inventory. Trying to get correct item and after multiple emails Houzz trying to track down original seller. Don’t just stay away- run from Houzz. The app has lots of great pictures to look at. However, when you enlarge a picture then go back to the list it starts you all over at the top of the list. It would be much better it the back button took you back to your previous place on the list view. This can get to be very tedious once you have scrolled a few pages down the list. App crashes when trying to rearrange photos within an Idea Book. Why oh why did you change the size of the news feed photos to be so tiny??? As an example, when taping on “Latest in Discussions” and then viewing the “design dilemma” discussion, the pictures used to be on the left and were large and easily identifiable. Now they are tiny thumbnails off to the right. Remember, the Houzz app is a completely VISUAL tool. It is a complete fail to make the photos in the feed so small....it totally takes away from what used to be a great experience. Tip....never, ever, make photos smaller especially when you are using them for design guidance. What were you guys/gals thinking?? Unusable app, tried to sign up and use app only to find I wasn’t able to complete sign up. Every time I tried to put my zip in the appropriate field it would force close. Attempted registration both on iPhone and iPad. Uninstalled and reinstalled multiple times, still no luck. The app shuts down on its own half way through a string of postings, and also when sweeping through pics in a story, what’s going on? Why oh why did you change the size of the news feed photos to be so tiny??? As an example, when taping on “Latest in Discussions” and then viewing the “design dilemma” discussion, the pictures used to be on the left and were large and easily identifiable. Now they are tiny thumbnails off to the right. 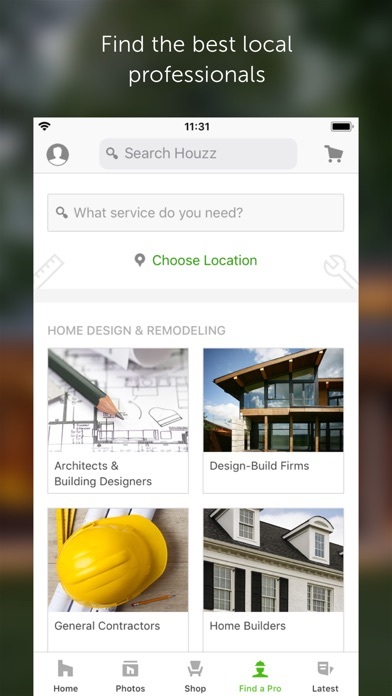 Remember, the Houzz app is a completely VISUAL tool. It is a total fail to make the photos in the feed so small and it totally takes away from what used to be a great experience. Tip....never, ever, make photos smaller especially when you are using them for design guidance. What were you thinking?? When reading long design dilemma threads, the app crashes, forcing me to locate the thread and start over. This happens on all really long threads with several hundred posts. Once the app starts crashing, the only way to read to the end is to switch to Safari. I love this app. Gives me so many great ideas. However recently, I noticed that if I am browsing through pictures and I click on the thumbnail to make the picture larger, after I exit the picture, it will take me all the way back to the beginning. So annoying! The app did not use to do this. Please fix. Thanks! Why does it scroll to the top??? I really enjoy the app and all of the ideas but it is really upsetting when I tap on a picture to look at an idea and then hit the back button it takes me back to the top so I have to scroll back down to where I was before. It is really frustrating and I wish they would fix this issue. Just got finished doing my house without this app. Might have been cheaper and easier with it. Keeps jumping to the top..
Every time I am browsing for pictures and I click on one and then click to close the window The screen jumps to the very top of the search making me have to scroll through everything I’ve already viewed. This makes the app completely unusable. It doesn’t do this on the web browser version. Fix photos When scrolling through and clicking on a photo when you go back to thumbnails it brings you back to the top and you lose your place and have to scroll all the way back down again. It would really help if the app wouldn't crash every time I'm directed to it from one of their promotional emails. Just a touch frustrating. The previous two times this happened, I've just jumped to a competitor for my purchases. Lost opportunity for Houzz. I have a love hate relationship with this app. In Design Home, one is given the challenge of decorating rooms with real, high end furniture in homes around the world. How fun! The caveat is the budget. The virtual cash and diamond awards are not sufficient. That leaves the user with 2 choices - purchase diamonds with real cash, or go to Tapjoy for awards. I found myself taking hours of surveys to earn diamonds to support my design habit. To add insult to injury, sometimes I didn’t actually receive the award. I have contacted Tapjoy multiple times for rewards I didn’t receive and have received no response. Hopefully, Design Home will up their free cash and diamond awards or quitting Design Home might end up being my New Years resolution. This app doesn’t work at all like they make it appear. You don’t see smart AR furniture in your living room as if it’s really there, giving you an accurate sense of perspective and size. No, it just gives you a fixed perspective 2D clip art photo of the furniture and YOU have to guess what size it is as you shrink or enlarge the image. There is no AR technology to this that I can see. It’s literally like putting stickers on your photo. Maybe that can be useful to an extent but it’s not even close to what I thought I was getting based on the preview photos and descriptions. I’ve relied heavily on this app for inspiration for our remodel. However, recently the app has started behaving badly. When searching for a feature (say wainscoting), then trying to filter for the room, style, etc., the app forgets about the feature I’m searching for. It just shows all the rooms that meet the filter criteria. Also, when reviewing photos in search results, if I select to learn more about a photo, then close the photo details when I’m done, the app returns to the top of the search results, rather than the last photo viewed. If The search results have a few hundred photos, it’s extremely time consuming to try to figure out where I was. These bugs make the app significantly less useful. I’m starting to look for a replacement. Deleted right before signing on using Facebook. Why do you need my friend’s list to get me signed in? The newest version of this app is absolutely horrible! It’s now extremely slow and returns to the top of the list each time you exit from looking at the pictures of a house! Please bring back the old version. I absolutely love this app, and refer to it often. I have built three homes and I am in the process of building my fourth. Not to mention two gut jobs in between all this construction. I even hired my decorator by looking at the site because I could see her work and read her reviews. My only suggestion is to be able to filter by state and not just metro area. I'm building a home in Florida so I have to look at Miami, Tampa, and Orlando separately. Why can't I just click on Florida instead? Please fix iPhone X, the photos are fully zoomed in as you scroll through making it impossible to browse through. I’ve remodeled & redecorated every room in my house using HOUZZ. I can be my own general contractor & designer! I have ordered many items as well & everything is impeccable quality. I like this app a lot. Or use it often. My only gripe is when I tap on the photo, and then go back, the scroll position resets on the photo grid. If this is fixed I will give it five stars. I am not sure if this is a bug or not but whenever I select an image to see the details page then go back to the feed. It force scrolls me back to the top of the feed instead of taking me back to the feed position that I left. This makes the app unusable to me and a major headache. I will try to see if this is fixed with the next update. Love the app, I especially love that you can view items in your space! The app is generally a good one. 1. I cannot view my orders or notifications. The screen never actually loads. 2. After making a purchase, there are a few items in which I cannot contact the seller. The shipping status never updates and I’m left wondering when I’m going to receive my product. 3. Everything else is ok.. Fantastic app. There is one issue, however. When you scroll down through images, then select a picture so that you can see it up closer, and then go back from that image, it throws you all the way back to the top. You’ll have to scroll all over again to get back to the spot you were at. Please fix this! Otherwise, incredible app for home design. 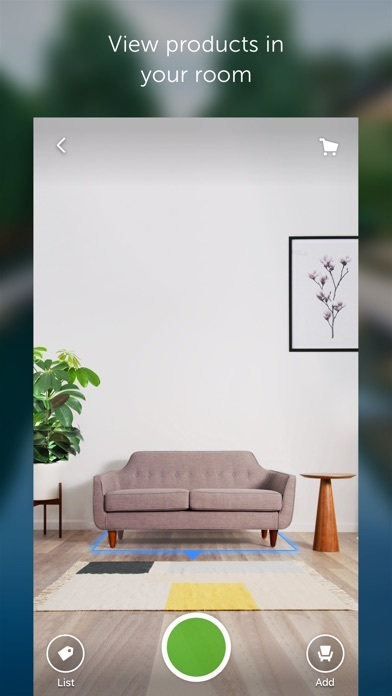 The app is amazing except for the fact that every time you screenshot something it immediately prompts you to save the picture on your houzz profile. This is a small nuisance, but until things change I cannot grant Houzz with a 5 star review. Just know I will never save my screenshots to my profile houzz. Never. I hardly ever look at it anymore. Everything loads so slowly and it has become so commercial. It used to be a genuine online community with fun articles and beautiful pictures. I’ll probably delete it soon.Sad that it has strayed so far from the original. When i press back from an image it goes back to the search results and scrolls back up to the top immediately, it’s very frustrating when you’re browsing/searching and it loses your place to look at an image. Also seems like the same images come up again and again. I love this app but a recent change in your app is very frustrating. When looking at photos or shopping selection. When you select the in app “back” (photo), it takes you back to the first photo, not where you left off. This means if you have been looking at photos for a while you after scroll a long ways through-very annoying. So I tap on a photo to get/see more info. When I’m done I push “ < back “ in top left corner of photo and it goes back to the very top of the page I’ve done a specific search for?? For example: I “searched” in photos for tropical interiors. I’d scrolled down the page about 120 photos, tapped on a photo I liked to see more info. When I went “back” to my search feed instead of returning to the spot I was at it starts at the top again. This happened numerous times and I got tired of having to scroll down hundreds of photos to continue where I left off. I just closed the app and hopefully the next update fixes this. Houzz has been a pretty good resource for ideas for a long time and has a decently useful app. However, recently I’ve noticed that when you swipe left while viewing a picture to go back to your photo search, it jumps ALL the way back to the top of all of this photos (instead of where you left off). This forces you to scroll all of the way back down to continue to Photos you haven’t seen. It didn’t seem like this was going to be a big deal, but it’s been frustrating enough to waste time on this review. I’ve used this app and loved it, but when I search and save it to a board, it automatically scrolls you to the top, so if you’ve scrolled a ways down you have to start all over to get to that point again. please fix. I ordered what we’re supposed to be high end bath towels that cost a pretty penny. What I received were rough scratchy garbage that shredded in the first wash. Houzz tells me the vendor was told to contact me which they never did. Houzz does not exercise any responsibility when it comes to enforcing communication between customers and vendors and they are a far cry from the excellent initiative eBay takes when a customer gets hosed on a garbage product. I will never order from them again! I loved this app to browse photos for ideas. But I made the mistake of making purchases and that has been a terrible experience. The notification and message features are cumbersome and jus don’t work. Houzz censored my review. There are multiple levels from Houzz to the supplier to the manufacturer so communication is impossible for refund. With these thousands of positives, you don't need mine too, but I have to add so I can say how much I appreciate the rich content of this app. American designers take a bow....you are as fabulous as these submissions in Houzz. Never ceases to amaze me, how extensive the site is, a room full of exploration, leading one room to another, lavishly done. Worthy of iPad, glorious as an iPad is....Houzz should win an Academy Award in all categories. ##### updating my review to lament the negatives others have posted. I use an iPad and not had any crashing like what is being reported by others in their reviews. Are you doing the updates for Houzz and your other your Apps? Go to App Store and engage Updates. Houzz is one delicious website. I've used it as a portal to find and buy high quality, well priced items for the home. It’s great for home improvement ideas of all kinds. Maybe in your computer settings, maybe remove the app entirely and reload fresh. Dunno, but I feel your pain. My wife placed a order for a discounted soaker tub. The next day her order was cancelled and she was not notified. They advertised the wrong price and did not hold up there end of the bargain and sell it for what they advertised. I like the app, however when I open up a zoomed in image of a product it is impossible to close the image. The ‘X’ in the top left corner doesn’t respond as it should. I end up closing the app and having to reset all of my filters to continue my search. This is beyond frustrating and renders the app useless. Update is not working properly. At the moment it is not displaying. Blank screen. I often need to go back to the email notice to access each magazine feature. A major flaw. The content is very good, however the operation of the site is wanting. We recently remodeled our summer cottage and I went to Beyond Shades looking for window treatment ideas. I ended up placing an order for all the windows - 19 woven wood shades and 5 wood blinds. Rose, the salesperson/ consultant who helped me was incredibly patient and helpful. She drove the hour and a half drive to the cottage to do preliminary measurements and make the final selections. After the installation she returned to make sure everything was perfect. The factory had incorrectly fabricated three of the shades. She immediately made arrangements for their replacement. The new shades are now in place and I couldn’t be more pleased. The installers employed by Beyond shades were professional, speedy and courteous. All in all, working with Beyond Shades was a pleasure. This new update is awful. Saved several ideas to ideabook but can’t retrieve it. Wasted all that search time. Tried to email a picture, to myself, that didn’t work either. Lots of good ideas but without and way to store, retrieve or share it is basically useless. Also, it would be nice to have some contact info to get help. Previous version much more user friendly. The title says it all. I sign into my Google account and nothing happens after that. The app is useless for me. Loving this app! It has given me tons of ideas that I can't wait To try!!! WOW, I love Decorating my home. I have friends who have asked me to come and decorate their homes. Now I tell them to download the Houzz app so that they can be creative and decorate their own home. This is a super great app and Many Super ideals! I love this app. It is truly amazing how you can transform a room to make it your dream home by looking at the multiple ideas Houzz app provides for you. Houzz is an amazing sight with so many wonderfully shared ideas. I credit this app with helping me do a kitchen renovation that I just love. Best thing about this app is that you can search gazillion of photos by key word so you can visualize what different decorating /remodeling styles look like. The search can be really specific like walnut counter island with exposed brick in kitchens and boom you have tons of photos. The discussion Boards are also good for asking advice. I like this app a lot, I use it all of the time. My only wish would be that the editors or whomever is in charge, would ask the architects and designers that if they are going to post photos of their work, they MUST answer questions when people ask! Some of them do, but many others don't and that is frustrating. Feels like they are using the app to advertize their work and not to showcase and share ideas and resources, which is supposed to be one of the reasons why this app is so unique and wonderful. Also, please don't let amateurs post bad photos of their half way done work, where they not only present a dark badly taken photo but they don't even show a before and after. My two cents! Like for looking and dreaming about improvements in our house. We enjoy the thought provoking illustrations and ideas. Building a new home and the various tools offered by this app are very helpful. The helpful vendor information makes it a one stop shopping experience. There is no way to search accurately for a particular size bed. No matter how many times I try to search for a full size bed. It gives me king size. It also crashes a lot. Easy to use. Nice place to organize design ideas. Also like the "where to buy" tags on images. I found Houzz as a resource for inspiration pictures in building a new house, but I quickly discovered that it held even more value in the forums, especially those that originated in GardenWeb, which were filled with long-time members and experienced professionals who gave their advice for free. Unfortunately, Houzz’s terrible management decisions have driven away many of those people. They’re destroying much of what made the site and app unique and valuable to me as a homebuilder. I’ve been loving all the updates they’ve been doing. One feature I liked was that you could save to multiple ideabooks at once. But now it only lets me choose one ideabook at a time, and then I have to save before I can save the same photo to another ideabook. Wish they would change it back... other than that, I love this app and it’s definitely one that I use on the reg! Sometimes it works. Sometimes it doesn’t. I saved 32 photo ideas with captions. I can retrieve the captions but not the photo ideas. Useless. This app doesn’t put things to scale well, and thus the scenes don’t fit together realistically. As someone who has dabbled in programming this sort of AR app, this is honestly not that great an effort IMO. They will keep sending them to you even after you Unsubscribe. Sure, a simple mark as spam, but still. Poor business practice. Clicked on to Houzz today to find a blank white screen. What's causing this now? Love the app but it won’t refresh the feed unless you close and reopen it. Dragging it down to prompt the refresh doesn’t do anything, no matter how long it’s been open. Please fix, as this is a really annoying bug. This isn’t a room planning app, it’s a shopping app. I was looking for something to draw the floor plan and use to plan furnishing for our new home. This isn’t it, despite coming up on top of most searches for “best home planning app!” Deleted it already. No support for Thermador appliances????? Seriously? Why is this brand not listed in this app? I didn’t like the app so much, so I deleted it. Then, as I had to sign up using my email, I keep getting unsolicited emails. I unsubscribe, but it keeps sending me different ‘types’ of emails. So far I have unsubscribed to 4 types of emails from Houzz. Stop, please stop. I love the idea but I need it to work. I am not able to sign in to my existing account to use the app. I try to use “sign in with Google” and switch over to the Google app to approve the sign in. Google says “sign in approved” but when I switch back to the Houzz app I just get the three flashing progress dots. Forever. I’ve tried again countless times over weeks but it doesn’t work. I’ll delete the app now. I am remodeling my kitchen. Was told to get an undercount Blanco sink because of durability, ease and beauty. 1st one came and was installed. Plumber didn’t notice the crack until he filled it up with water. Saw puddles in cabinet underneath. Ugh! Replaced with 2nd Blanco sink. Installers inspected this one before putting in and found a crack in this one! I am waiting on my 3rd Blanco to arrive and wondering if I should cancel this and order something else. All of my installers are very surprised by the cracks. They all say they haven’t seen this happen. Maybe 3rd time’s a charm? This app is absolutely the best! I love the fact you can take pictures to actually see how things will look in your home. Bought a rug from this app. I knew there was a small window to reach out to them if I decided to return it. Which I did, so I emailed them within a few days. They got back to me during vacation so I did not get the chance to respond right away confirming I did want to return the rug. When I did, it was still technically within the returns window but they said it took me too long and now the window has passed. 3 weeks go by if back and forth and they said theyre finally willing to accept the return given I reached out right away, despite it being outside the return window. Only they emailed me this during my holiday vacation when I was visiting family. I asked if I could return it when I got home and they said no and were unwilling to work with me! Now they're blaming me that a return will not be accepted 6 weeks late even though I waited for them for 3 weeks to make up their minds! I am in the interior decorating field and find "Houzz" to be a wealth of ideas and information. Just purchased bar stools through the app and was happy with the process. 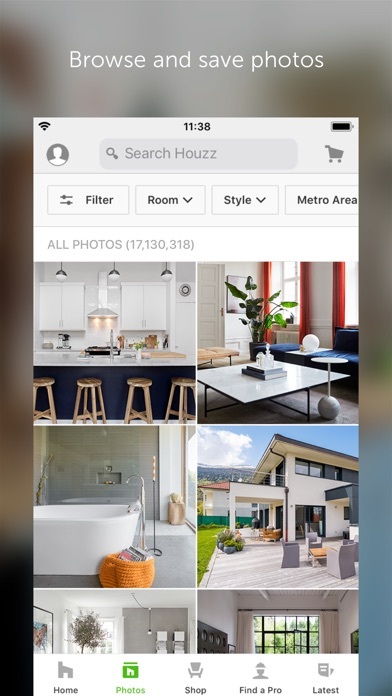 The app is amazing except for the fact that every time you screenshot something it immediately prompts you to save the picture on your houzz profile. This is a small nuisance, but until things change I cannot grant Houzz with a 5 star review. Just know I will never save my screenshots to my profile houzz. Never. Bye. This is the best app ever. I totally recommend it ❤️! I would give it 10 stars bravo! The app itself is great. The content isn’t for the average person. It’s not that the products are out of my price range, they’re not. The houses are so grand and the floor plans are so far from average, I really couldn’t find anything remotely close to my space. I deleted it. I really like Houzz and like to use ideabooks to organize ideas for projects. I’m disappointed that the mobile app doesn’t allow you to link back to source of an item in an ideabook like the website does. I also wish the search bar was available from all pages.